Rookie Bryan Rust was the only expected player missing from Wednesday’s practice at CONSOL Energy Center. Head coach Mike Sullivan said Rust is day-to-day with a lower-body injury and will not play against Nashville on Thursday. 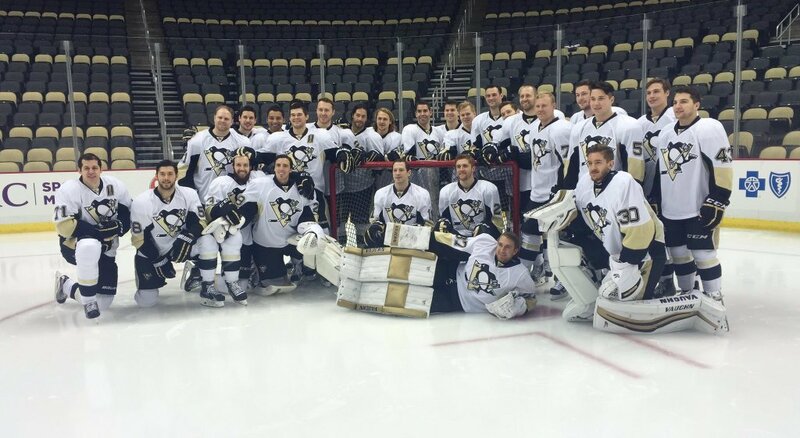 Earlier that morning, the Pens announced Rust as the winner of their Rookie of the Year Award. In the 41 games he’s played, Rust has 11 points (4G-7A) – including an assist he earned in Pittsburgh’s 5-4 shootout win over Buffalo on Tuesday (he played the entirety of that contest, even taking a shift in overtime). Sullivan said the 23-year-old second-year pro has improved a lot since their time together in the American Hockey League with Wilkes-Barre/Scranton earlier this season. Defenseman Brian Dumoulin, who missed the last 2-plus games with an upper-body injury and is listed as day-to-day, was also absent from the skate. Center Evgeni Malkin, who has missed the last 9 games with a upper-body injury suffered on March 11 at Columbus, took the ice this morning before practice but Sullivan said there is no change in his recovery time frame of 6-8 weeks. No one would have blamed Kris Letang if he’d taken the day off, as he logged over 30 minutes for the third time in five games against Buffalo on Tuesday. The defenseman ended up with a career-high 35:14 on the ice, and he was feeling it after. From a few stalls over, fellow defenseman Ben Lovejoy marveled about his teammate's ability to handle such a strenuous workload. “It’s incredible what he’s doing,” Lovejoy said. “He’s playing hard hockey. He’s all over the ice and winning battles. It’s really fun to have someone like that on our team. Pittsburgh has controlled the month of March, as they are 11-4, have outscored their opponents 55-32 and climbed into third place in the Metro Division – one point behind the Rangers and three ahead of the Islanders. The Pens look to close out this page of the calendar with a win against Nashville, who visits the Steel City Thursday night. “I don’t think there’s one magic bullet,” Sullivan said. “What I see is a group that’s bought in to playing a certain way. When we do, we’re a good hockey team and can beat any team we face.